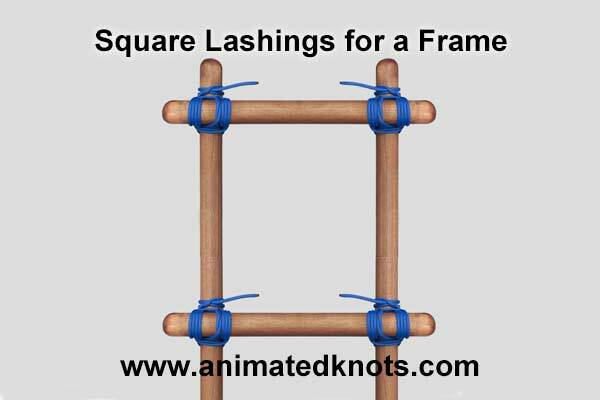 Scouting: Square lashings can be used to make a rectangular frame as shown here. Many applications have been described including: making support frames; when two trees are close enough, a table can be supported by a pair of poles or branches lashed horizontally either side of the trees; a fence can be constructed by driving poles into the ground and then joining them with bars attached with Square Lashings; and a raft can be created by lashing bamboo poles across each other. Tying it: The animation shows the preferred method of making this lashing. Turns are added internally around one pole and externally around the other. Here, each extra turn is added inside the previous one on the horizontal pole but outside the previous one on the vertical pole. This presents a flat array of turns to be surrounded by the Frapping Turns – and each turn will be subject to tightening. Frapping Turns: The turns surrounding the lashing at right angles exert a tightening effect on the lashing. These turns are known as Frapping Turns. Pulling them as tight as possible makes the Lashing more secure. Various techniques are recommended, but I’m indebted to Dana Holgate for the following: wrap the rope around a stick, stand on the pole, bend your knees, hold the stick across your thighs and then pull by straightening your legs. Alternative Finish: The final half hitches may be located on top of the Frapping Turns, i.e., add two more Frapping Turns in the form of Half Hitches.